The experience is quickly becoming a leading way that people learn about products, ideas and services. In the realm of retail in particular, experiential marketing is giving rise to new modes of media and product consumption. Simultaneously, from the consumer end, where and when people intake information or purchase items is evolving. Businesses are innovating to fit what they’re selling into people’s lifestyles—marketing not just goods or ideas but opportunistic experiences. 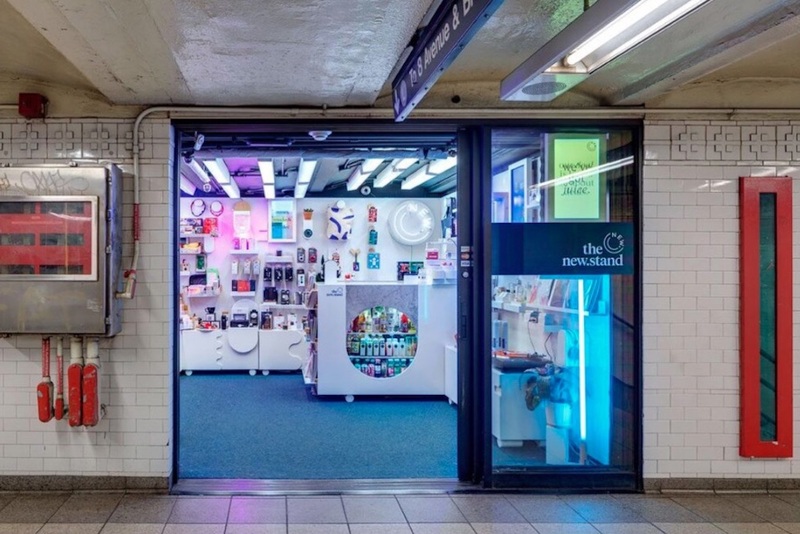 In this extract from a recent podcast interview, PSFK founder and editor-in-chief Piers Fawkes talks to Andrew Deitchman, founder of New Stand, an app-based store that combines retail and media to function like customers’ favorite blog and most-frequented bodega all at once. Andrew explains how his service is reinventing the customer experience by using a special kind of membership to drive loyalty. Piers: What are the trends you see impacting the retail and consumer experience? Andrew: More and more people are trying to understand what experiential is within the realm of retail. It’s not just about transaction and selling goods, but how to use physical footprints as a way of building a relationship and connecting with people while entertaining them. Many landlords are understanding that just collecting rent is not necessarily playing out the way that it used to in a world where e-commerce is becoming more and more dominant. At the same time, physical retail is still very valuable. Whether it’s guiding shops that you’re seeing or using malls in a way that’s about entertaining people and creating programming, the use of space, as it relates to what human beings are trying to accomplish or get out of their day, is changing quite a bit. Additionally, you’re going to see more influx of technology as it relates to both the shopping experience and entertaining people. The mere idea of coming into a store and knowing that you’ve checked out a product—maybe you didn’t buy it there, but you bought it somewhere else. Being able to have that attribution, understand that somebody actually came in, picked up this product, looked at it, spent time with it. Perhaps being able to collect some information about them to follow up on the sales perspective and pass that information along to the manufacturer so that they can do a direct sale. The idea of loyalty and points, how that starts to connect to other people’s desires, what they want to do with their time outside of shopping—I see all these things as something that is going to continue. There’s also the idea that we can spend money in a store, but that money I’m spending in a store maybe buys me rewards for things that might be more content-based. When we look at what Amazon is actually doing as they’re blending products, services and experiences, it’s about optimizing relationships for the essential things that somebody wants. It’s great that I want to order cereal to my house, but maybe that should also earn me discounts in terms of streaming content. How those things get blended right now from an e-commerce perspective makes a lot of sense. You’re going to see more and more of that happening in the realm of physical retail as well. We talk about experiential retail quite a lot, but you’re talking about a layer of intelligence. I do wonder about the use of data. I imagine retailers and brands need to think about appropriate ways to communicate with their customers, and not just use everything at their disposal. For sure. There has to be a greater level of transparency in terms of the relationship. People need to understand when they walk into a store if they are actually opting into a deeper relationship based on some set of expectations set up by the retailer. The idea that somebody could come into New Stand, check out a product and be able to get points for doing so is interesting to me. People that have a sense that our store is a place I come in to buy basic things, but also check stuff out. Just by the nature of checking stuff out, I’m earning points. I understand that there’s a relationship where the store might want to follow up and see if I’m interested in that product. As long as people understand that, it can be a positive relationship. To me, it’s very different from the retargeting and trolling that you feel on the web. I happened to have gone onto a site; now every ad I’m seeing relates to that. It doesn’t feel very thoughtful. It just feels robotic, which is what it is. Can you give us an overview about what the New Stand retail experience is today? On a very basic level, we’re creating better designed, better merchandised, better staffed convenience stores, typically put into locations that are convenient and out of the way. We have stores on ferry boats. We have stores in the lobby of an office building. We’re in airports. When people walk in, they can grab something that they need, whether it’s a drink or snack. If they have a headache, there’s Tylenol. But then also they discover that there are all sorts of other cool products that they might not have expected to see in more of a convenience retail environment, whether that’s a great new health and beauty item, tech product or fashion accessory. There’s an element of discovery that’s blended into the essentials and need-based moment that people experience. We also have terrific sales associates. When somebody comes in, beyond helping them with what they need, our staff is trained to be able to talk to them about cool products that also might be there. People can enjoy that moment of discovery. We also encourage people to become members. Membership is free for New Stand—it’s about downloading our app. When people do that, they then receive this terrific content twice a day. We have an editorial team that curates this content. Everything from music playlists, cool things that might be happening in and around the city, interesting things that might be happening in the realm of science or art, new restaurants that are opening and more. What’s cool is there’s a loyalty program embedded into that app. When you get to 300 points, you get $10 to spend at the store. You don’t just earn points for spending at the store—you also earn points for every article that you click on. We’re rewarding people’s content-consumption behavior as well as their product-consumption behavior. At the end of the day, New Stand is not just a retailer—it’s also a media company. I want to create this level of engagement with people and reward their engagement with our content by turning it into discounts. It seems to me that you’re keen to find locations that have been ignored in the past and reinvent them to intercept people during their routine. Even though we might think about ferries, subway stations and offices as mundane experiences, actually that’s where a lot of people are commuting—it’s got great footfall. Then you add a layer of media and experience to engage them and keep them coming back. That’s right. We’re also adding services. We’re going to be launching our first service called Swap Charge, which is a grab-and-go charger program. If you’re a New Stand member, you can pop into any of our locations and sign out one of these awesome mobile chargers that we’ve designed and leave. You can drop it off at the next New Stand, come back or drop it off the next day. We’re trying to add value to the relationship. We talk about ourselves as a day-improvement company, and we take it pretty seriously. We’re trying to be thoughtful around how busy people within an urban setting are living their lives, and how we can better serve them. We’re operating in locations where, in the past, newsstands would have operated. An office building is somewhere people can’t operate anymore under a previous model because people don’t purchase printed media so much anymore. Other than in an airport, nobody buys newspapers and magazines to the extent that they used to. Everything exists on the phone. In the past, people might’ve been able to keep a business running a newsstand downstairs in their office building successfully, or at least make a living. When people were buying a newspaper, they’d also buy gum, mints or whatever it was. Since nobody’s even going in there to buy the content, they’re not going in there to buy anything else. Because we are blending revenue streams, we can operate in places that others would not. Also, doing so allows us to create a very special relationship with landlords where we’re actually customizing content based on the location of the building that we’re in to be able to add computer-aided communication. That adds a lot of value and makes it a better experience for the people who are going in and out of that building every day. I didn’t think about disruption happening at the newsstand level where, because of digital experience, these previous newsstand owners can’t compete. You’ve been able to think of a successful business model because you have a broader, meta-level experience for consumers. What’s interesting is that if you dial the clock back before the internet, before television and radio, newsstands were in many ways the ultimate content distribution platform. They were the Verizon Fios of paper. It was how people would grab their paper and figure out what was happening in the world. There were a lot of things that were discovery-based there, too. People were picking up Life Magazine and picking up magazines that were talking about products. This was the place where they went to discover new things. All of that now happens in the digital world. To us, you can still discover things that are happening in and around the building that you’re in. You could use the physical space as a moment to discover products and ideas. We’re reimagining how you use that connection point to engage with people, to add value in a business model and to have that last-mile connection for people. How are you working with brands, other companies and organizations to be part of this equation? It’s still early days in terms of things we’re doing from a brand partnership perspective, but increasingly it’s becoming part of our business. Obviously, the intent behind New Stand is to be more of a media platform than anything else. The kinds of engagements that we’re making are ones where brands want to have a physical product introduced to somebody, but also to have a digital layer around it. A good example is a program we did with Urban Decay makeup brand where they did a partial takeover of one of our locations at Union Square. We had this product that tied in with Basquiat. We had it a week before it was released in Sephora. We promoted it in our app and in our store. Tons of people came in to grab it first, to experience it. We created special music playlists in our app around 1970s music and a lot of articles around street art promoting the product. It was a holistic program that involved people being able to check out this new product physically, purchase it and experience it digitally as well. We like having this holistic approach to brand partnerships where there’s a digital and a physical component to it. I see that as something that’s only going to grow with all of the privacy issues lately with social media and media powers. Marketers and advertisers are growing a little tired of doing another buy on Facebook. They want to do something else digitally right now and try to figure out how they can go beyond to have a deeper engagement with people. How do you start to productize that? Having spent years in the past running my agency and doing a lot with marketing, it’s not that easy to create a pop-up shop. It’s taking a temporary lease, shipping, staffing and all sorts of stuff just to get something up and running. You need to actually drive an audience there. How do you get people to even come to the pop-up shop that you’ve already spent a ridiculous amount of money on? There’s no turnkey digital that comes with it. New Stand will be in 50 locations by the end of the year and 500 locations in another 18 months. This idea seems to intersect with the concept of last-mile delivery: you’re there, either physically or digitally, with the consumer. That’s right. There’s certainly an advantage in having that last-mile access point with people. At the end of the day, what we’re building, from a consumer perspective, is focused on improvement, creating these great little stores, having a terrific app, being able to engage and reward people. But we’re also laying fiber optic cable in the form of convenience stores. We’re building a network up that allows us to connect with people as part of their daily routines. They might see us in a subway platform. They might then see us in their office building. They might see us in an airport. All of those points of connection are moments where we can serve a basic need as well as introduce people to a product, a service or whatever it is that our brand partners want to reach them with. It’s a tremendous platform. I believe that there are a lot of companies out there—Google, Facebook, Walmart, Amazon—that are trying to figure out how the physical components of the world will tie into their digital ambitions. What New Stand does is something that can either add value to that or ultimately challenge it on some level. Can you talk a bit about where your company is heading? We still have a lot that we’re building out in terms of the experience for consumers as well as everything from private label products to services. We’re working on all aspects of highly gamified and fun loyalty programs. What’s most interesting is the infrastructural component to what we’re building. We’re having conversations around partnership with companies that are building the new tech that’s going to exist in the subway system, like the MTA. When you no longer have a MetroCard, and it’s an app, how does New Stand become a key partner in that bit of infrastructure? There are lots of companies out there—ones like Hello Alfred, which is working on how you create services for people within residential buildings and ultimately commercial buildings, that cover everything from dog-walking and dry cleaning to stocking your fridge. It’s very smart for us to have connections and partnerships with those companies. There’s a lot of investment happening in real estate technology around building access and trying to create portals for buildings. On some level, it’s helpful for the tenant base. How do I book a conference room? How do I order food? There’s a role for a company like New Stand to play in all of these realms as a content contributor and a relationship builder. We’re using the physical footprints and the app that we have as a means to being a strong partner to see these new behaviors with technology, to monetize them through media and just to learn about them overall. We’re going deep into the build world as it relates to technology. The conversations that we’re having every day are fascinating and productive. Within the next few months, we’ll be making some exciting announcements. As people’s consumption patterns continue to evolve, companies like New Stand are finding new places and moments to reach customers and build brand affinity. For additional insight into the realm of retail, listen to our PurpleList podcast or download our many reports on the sector.